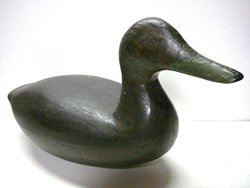 The following photo's are a few of the decoy's stolen from my office over the weekend of 10th-12th of December, 2011. I want to stress that these are all items that were for sale and the better decoys some of which I have no photo's of, all come from my personal collection. No customer product is displayed there as that is all safely manned by a very good security system 24/7 in another location. 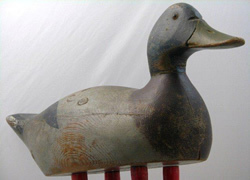 The office had no security system and although insured, the sentimental value of decoys given to me and things I have picked up over the years is the real loss as I am sure many of you realize. The following is a list of additional decoys taken that I am not able to provide photo's of at this time. Early sleek Maine Scoter with a small tight crack across the bill. A very nice swimmer probably from Louisiana. The wood is the color of honey. Pair of Charlie Joiner Teal, one with a turned head. One Wildfowler Balsa Hen Bufflehead. I am asking that if you see any of these decoys or suspect that someone is trying to sell any of these, I would ask that you contact me immediately and I will be glad to pay you any reasonable amount of money for your troubles. 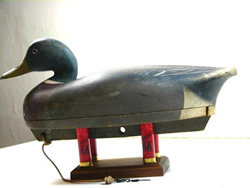 Under the duress of my recent robbery, I listed a decoy as stolen in error which was sold and is not to be associated with the buyer as someone who would ever deal in "tainted" decoys. This was an error and we wish to apologize. Please contact me if you ever have any questions about this decoy.